The above is a video of Jeff’s singing. I have another video of his speech but that is not uploaded to Youtube yet. I went to the appreciation dinner given to the campaign workers who helped in the Jelutong DAP constituency earlier in the evening. 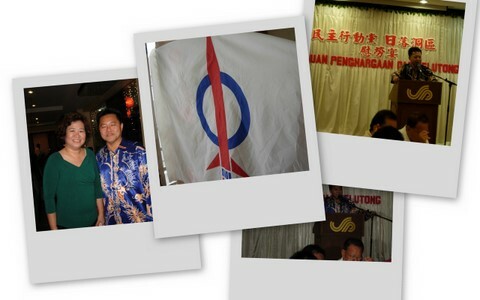 Jeff Ooi is the Member of Parliament for Jelutong and Malaysia’s first blogger turned politician. When I got there, I told Jeff, “Hey, the last time I took photo with you, it was a blogger with a blogger. 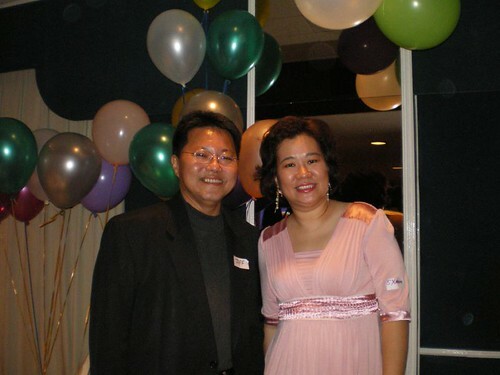 Now, it is a blogger and a MP.” Of course, Jeff is very humble and said he is still the same Jeff Ooi the blogger. The above photo is taken on 10th March 2007 in KL at the Together Gather Bloggers Party. And here’s a collage of the photo taken today. I make it small-small so that I look slimmer. LOL. I femes lah, you don’t know meh? Hehehe, no lah, actually one of Jeff’s dedicated campaign worker invited me. Thanks F.F.! I made a lot of observations on politics and the regular rakyats. Things are so much different now, especially in Penang. I have plenty to write on the good vibes I feel. But now, I must go to sleep because we have choir on Easter morning! Next Next post: Wait a minute, isn’t the Sultan of Terengganu also our DYMM Seri Paduka Baginda Yang DiPertuan Agong? Eh? You told me you like going to these dinners because there was free food???? Bwahahahaha!!! pablo – Ya, that’s what the politicians are telling us, “You Penangites will be the role model for all the other states. Oooo Lilian, you really look pretty in that dress. Really a honour to be able to take photo with our taikor blogger. Tat will only increase my determination to blog even more and be as accomplished as you one day! Hehehe… you’re rite! you really femes la! Hi mom (5x), I think you are one great gal, down to earth two feet firmly on the ground too. Hang in there and one day you will see your Big Boss. u r welcome and many many thank you for your kind attendance. keep in touch , and i hv “inserted” your contact under the “volunteers” database this morning .. take care.